Like an oasis in the heart of an urban landscape, Novotel Surabaya Hotel & Suites is a unique 4-star resort in Surabaya's business district. Holidaymakers and business guests alike will be enchanted by the landscape gardens, outdoor pools and numerous facilities such as conferencing facilities, a fitness center, outdoor pool, sauna, Jacuzzi, tennis courts, basketball facilities, a Kids Club, Mini Outbound & Animal Conservatory. With the city on your doorstep, prepare for an exciting stay at Novotel. Approximately 30 minutes from Juanda Airport and Rungkut Industrial Estate. Approximately 5-minutes away from Marvell City Shopping Complex while International Hypermarket is at our doorstep . 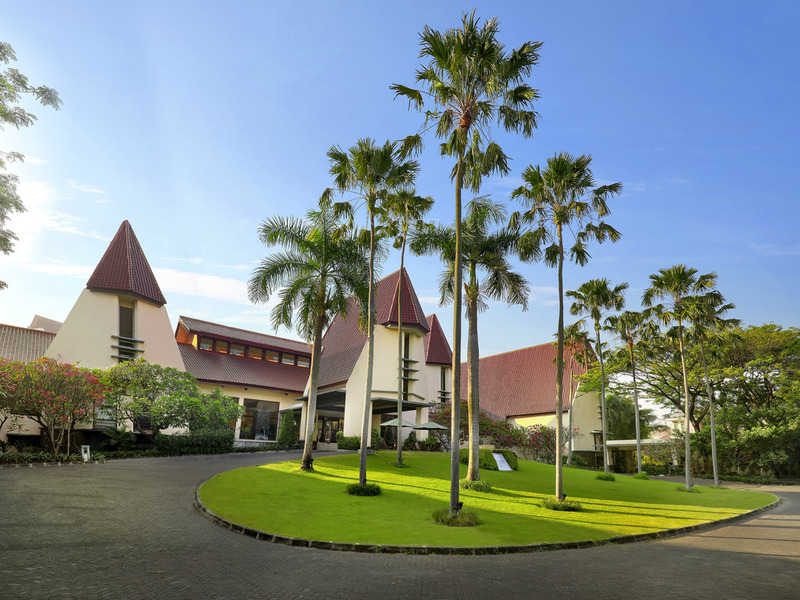 Novotel Surabaya located in the main business district of Surabaya, close to shopping centers, city landmarks and tourist attractions. Nice experienced stay in this hotel. The staff very nice and warmth. Most of our family visit in surabaya, we choose to stay in Novotel, it never dissapointed and it is really a family hotel. From the room, pool, breakfast is awesome. Dear Mr. Erik Oktavianus, We very much appreciate your comments regarding your stay at the Novotel Surabaya - Hotel & Suites. It is always a pleasure to receive positive feedback. I will share your comments with our team. I am sure that this feedback will serve as an encouragement to all of our staff as we strive to continuously improve the quality of our services. Thank you again for sharing your experience, and we hope your next visit will be as pleasant as the previous one. Sincerely, Bambang Erwin S.
Dear Mrs. Maifalinda, Thank you for staying with us and to share your valuable experience during your time in Novotel Surabaya Hotel and Suites. It is a pleasure to receive a positive feedback. We will share your experience to our team. We believe that this feedback can be a motivation for our staff to continue in improving our quality of services to our guest. For issues that may or has happened, your suggestion and comments is paramount for the hotel. Once again, thank you for the feedback and we hope that your next visit will be as enjoyable as the previous one. Sincerely , Bambang Erwin S.
I arrived at Novotel Surabaya on Monday and the welcome was overwhelming. I was quickly checked in and explained all i had to know. my stay was one to remember and cherished because of the friendly and helpful staff. Dear Mr. Yudhy Eko, We very much appreciate your comments regarding your stay at the Novotel Surabaya - Hotel & Suites. It is always a pleasure to receive positive feedback. I will share your comments with our team. I am sure that this feedback will serve as an encouragement to all of our staff as we strive to continuously improve the quality of our services. Thank you again for sharing your experience, and we hope your next visit will be as pleasant as the previous one. Sincerely, Bambang Erwin S.
Dear Mr. Indra, Thank you for staying with us and to share your valuable experience during your time in Novotel Surabaya Hotel and Suites. It is a pleasure to receive a positive feedback. We will share your experience to our team. We believe that this feedback can be a motivation for our staff to continue in improving our quality of services to our guest. For issues that may or has happened, your suggestion and comments is paramount for the hotel. Once again, thank you for the feedback and we hope that your next visit will be as enjoyable as the previous one. Sincerely, Bambang Erwin S.
Just give us the best price not too expensive..
Dear Mr. Romy, We very much appreciate your comments regarding your stay at the Novotel Surabaya - Hotel & Suites. It is always a pleasure to receive positive feedback. I will share your comments with our team. I am sure that this feedback will serve as an encouragement to all of our staff as we strive to continuously improve the quality of our services. Thank you again for sharing your experience, and we hope your next visit will be as pleasant as the previous one. Sincerely, Bambang Erwin S.
Dear Mr. Yohanes da S., Thank you for staying with Novotel Surabaya Hotel and Suites. We feel grateful that you have taking your time to share with us your valuable feedback. Having read on your feedback, it is with our utmost regrets and sincerest apology that you have to undergo such experience. We believe that it must have been a very agonizing experience. Please rest assures that the issue will be highlighted and follow up by the related department as we do not wish that the same issue happen again in the future. We hope that you still reserve the confidence and still choose the hotel as your preferred accommodation. We assure you that should you returned to stay with us again, you will experience and more enjoyable stay compare to the previous one. As such, we are always looking forward to welcoming you back on any future opportunities. Sincerely, Bambang Erwin S.
Our stay was quite enjoyable, one thing that I think need to be improved is the food quality for the breakfast buffet. The quantity was lacking (many items were missing and no restocking until we were finished eating). Bapak Soewito yang terhormat, Terima kasih telah tinggal bersama kami dan atas waktunya untuk menyampaikan pengalaman Bapak selama kunjungan Bapak di Novotel Surabaya Hotel and Suites. Sangat menyenangkan bagi kami untuk menerima tanggapan yang positif. Kami akan menyampaikan pengalaman Bapak kepada tim kami. Kami yakin bahwa pengalaman ini akan menjadi motivasi bagi semua staf kami untuk terus meningkatkan kualitas layanan kepada para tamu. Untuk beberapa kekurangan yang mungkin atau telah terjadi, saran dan komentar Bapak akan pastinya kami jadikan masukan yang sangat penting. Sekali lagi kami ucapkan terima kasih atas kesediaan Bapak untuk menyampaikan pengalaman Bapak, dan kami berharap kunjungan Bapak selanjutnya akan sama memuaskan seperti kunjungan sebelumnya. Hormat kami, Bambang Erwin S.
Dear Mr. Rosi Kusuma, We very much appreciate your comments regarding your stay at the Novotel Surabaya - Hotel & Suites. It is always a pleasure to receive positive feedback. I will share your comments with our team. I am sure that this feedback will serve as an encouragement to all of our staff as we strive to continuously improve the quality of our services. Thank you again for sharing your experience, and we hope your next visit will be as pleasant as the previous one. Sincerely, Bambang Erwin S.
Dear Mr. Gemma Purnama, We very much appreciate your comments regarding your stay at the Novotel Surabaya - Hotel & Suites. It is always a pleasure to receive positive feedback. I will share your comments with our team. I am sure that this feedback will serve as an encouragement to all of our staff as we strive to continuously improve the quality of our services. Thank you again for sharing your experience, and we hope your next visit will be as pleasant as the previous one. Sincerely, Bambang Erwin S.
Dear Mr. Yanto, We very much appreciate your comments regarding your stay at the Novotel Surabaya - Hotel & Suites. It is always a pleasure to receive positive feedback. I will share your comments with our team. I am sure that this feedback will serve as an encouragement to all of our staff as we strive to continuously improve the quality of our services. Thank you again for sharing your experience, and we hope your next visit will be as pleasant as the previous one. Sincerely, Bambang Erwin S.
Dear Mr. C. Roy, We very much appreciate your comments regarding your stay at the Novotel Surabaya - Hotel & Suites. It is always a pleasure to receive positive feedback. I will share your comments with our team. I am sure that this feedback will serve as an encouragement to all of our staff as we strive to continuously improve the quality of our services. Thank you again for sharing your experience, and we hope your next visit will be as pleasant as the previous one. Sincerely, Bambang Erwin S.
During we stay there, wifi only available in lobby and restaurant area. So i need to hang out at pool area and when i leave, the connection suddenly lost. My room at tennis court area. I valued wifi so much and for the hotel chain like this, I feel miserable that the connection is worst. Dear Mr. Hazman Husaini, Thank you for staying with Novotel Surabaya Hotel and Suites and thank you for taking your time to share with us your stay experience. We are excited to receive your positive feedback and definitely it will be shared among the team. Your feedback will surely become a motivation for the team to continue in maintaining the same service quality, or even better. Mr. Hazman Husaini, we hope that you continue to choose us as your preferred Hotel. As such, we are always looking forward to welcoming you back in the near future. Sincerely, Bambang Erwin S.
Dear Mrs. Maria H., Thank you for staying with us and to share your valuable experience during your time in Novotel Surabaya Hotel and Suites. It is a pleasure to receive a positive feedback. We will share your experience to our team. We believe that this feedback can be a motivation for our staff to continue in improving our quality of services to our guest. For issues that may or has happened, your suggestion and comments is paramount for the hotel. Once again, thank you for the feedback and we hope that your next visit will be as enjoyable as the previous one. Sincerely, Bambang Erwin S.
A very nice hotel for the entire Family. My only complaint was in the Bathroom Shower. The floor was too slippery and needed a towel on the floor. Would be good if there were some hand rods to hold onto in the bathroom. The room was good, clean with green surrounding environment. Overall a good experience. Friendly and helpful staffs. The breakfast was plentiful. Dear Mrs. Josephine, We very much appreciate your comments regarding your stay at the Novotel Surabaya - Hotel & Suites. It is always a pleasure to receive positive feedback. I will share your comments with our team. I am sure that this feedback will serve as an encouragement to all of our staff as we strive to continuously improve the quality of our services. Thank you again for sharing your experience, and we hope your next visit will be as pleasant as the previous one. Sincerely, Bambang Erwin S.
Dear Mrs. Gaby Nathania, We very much appreciate your comments regarding your stay at the Novotel Surabaya - Hotel & Suites. It is always a pleasure to receive positive feedback. I will share your comments with our team. I am sure that this feedback will serve as an encouragement to all of our staff as we strive to continuously improve the quality of our services. Thank you again for sharing your experience, and we hope your next visit will be as pleasant as the previous one. Sincerely, Bambang Erwin S.